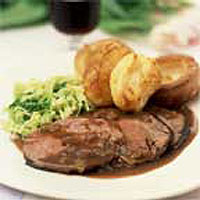 Tender roast beef with puffed and golden Yorkshire puddings and rich, juicy gravy is an unbeatable combination. Serve with crispy roast potatoes and Savoy cabbage. Preheat the oven to 180°C, gas mark 4. Weigh the beef to calculate the cooking time. Place the beef bone-side down in a roasting tin, rub the mustard powder and seasoning over the fat crust and place in the oven. Meanwhile, make the Yorkshire puddings. Sieve the flour and a pinch of salt into a mixing bowl. Make a well in the middle, pour in the egg and milk and gradually stir into the flour to form a thick, smooth batter that coats the back of a spoon. Cover and chill in the fridge for about 30 minutes. About 5 minutes before removing the beef from the oven, pour a teaspoon of oil into 8 holes of a 12-hole muffin tin and place in the oven for 5 minutes to heat. When the beef is cooked, transfer it onto a warm plate, cover loosely with foil and rest for 20 minutes. Meanwhile, remove the muffin tin and increase the oven temperature to 220°C, gas mark 7. Pour the batter evenly into the oil-filled holes and bake the puddings for 20 minutes, or until golden and well risen. To make the gravy, place the roasting tin with the meat juices on the hob, add the onion and fry gently for 2-3 minutes until softened. Spoon off any excess fat and stir in the flour. Turn up the heat, then gradually stir in half the wine and stir to loosen all the bits from the bottom of the tin. When the wine has nearly evaporated, repeat with the remaining wine. Finally, stir in the hot stock, horseradish sauce and French mustard, and simmer gently for about 5 minutes. Check the seasoning. Serve immediately in a warm jug. The secret to successful Yorkshire puddings is to get the tin and the oil really hot. There should be a good sizzle when the batter is poured into the hot oil. If you don't like the idea of carving a bone-in joint, the same cut is available from the Meat Service Counter with the bone removed and rolled. Allow 100g-175g off-the-bone meat per serving.